Fluorescence decays (a) and fluorescence anisotropy decays (b) of poly(dGdC).poly(dGdC) (red), dGMP (green) and dCMP (blue) recorded by the upconversion technique at 330 nm. The DNA double helix poly(dGdC).poly(dGdC) is studied by fluorescence upconversion spectroscopy with femtosecond resolution. It is shown that the excited state relaxation of the duplex is faster than that of the monomeric components dGMP and dCMP. This contrasts with the behavior of duplexes composed exclusively of adenine-thymine base pairs, for which an overall lengthening of the fluorescence lifetimes with respect to that of an equimolar mixture of dAMP and TMP was reported previously. Despite the difference in the excited state deactivation rate between the two types of duplexes, the signature of ultrafast energy transfer is present in both of them. 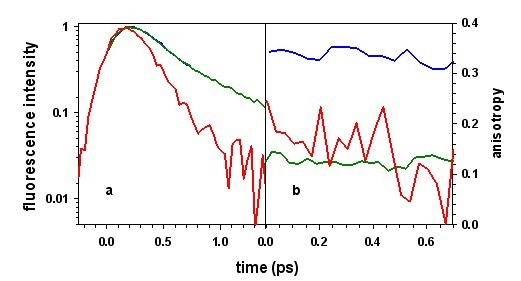 It is attested by the decrease of fluorescence anisotropy decay of the duplexes on the sub-picosecond time scale, where molecular motions are inhibited, and is corroborated by the fact that their steady-state fluorescence spectra do not change with the excitation wavelength. Energy transfer involves excited states delocalized over at least two bases, whose existence is revealed by the UV absorption spectrum of the duplex, clearly different from that of an equimolar spectrum of dGMP and dCMP.